Some of the first Green Lantern comics I remember reading were from 1968-1970, when Gil Kane and Murphy Anderson were the art team. Issues #73 and #74 featured Sinestro and the return of Star Sapphire and featured this dynamic double page spread of the two adversaries fighting above the beaches of Coast City. This two-part story had everything—action, romance, agony—and for a while it looked like Carol Ferris was going to wipe Sinestro on the ocean floor. 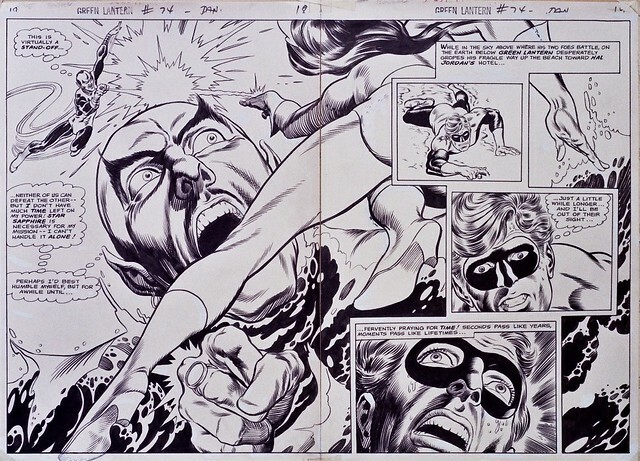 The Gil Kane Unchained page on Facebook recently posted the original art to this splash page, and it looks terrific. Gil Kane’s crazy camera angles really made an airborne fight scene look like no other comic book. Anderson’s ink style was very smooth and polished. You have to go back and re-read these comics while playing Donovan’s Sunshine Superman in the background. Nuff Said!